The Shiba has a life expectancy of 12 to 15 years. An ancient Asian breed, originally from China, it’s the smallest of the six Japanese Spitz-type. 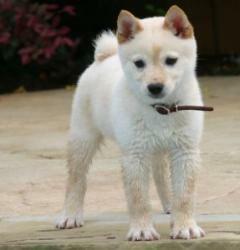 The Shiba Inu breed looks just like a miniature version of its big brother, the Akita Inu. They’re small, compact little dogs with a pointed face and broad forehead. The ears are triangle in shape and stand up straight. The Shiba Inu has a plush double coat in a variety of colours. This breed sheds a great deal. They are around 13-16 inches in height and weigh about 15-25 pounds, which make them a good pet for an apartment. The Shiba is a very lively and alert dog. It’s also one of the cleanest dog breeds around. House training is no problem with this little puppy. It’s a brave, confident, courageous and fearless breed. So keep a close eye on them so they don’t get themselves in trouble. The Shiba hardly ever barks which your neighbours will surely appreciate. They can however let out an ear-piercing shriek. They bond closely with their owner. They won’t be a problem if you socialize them properly as a puppy. They have a stubborn and strong mind. If they feel you’re not the pack leader they will take over your household and make their own rules. Other dogs or cats won’t be a problem as long as they were raised together. They have hunting instinct, so watch out for small pets like rodents. The Shiba is hardy and healthy with very few genetic weaknesses. Some lines however suffer from slipped kneecaps (patellar luxation), or hip dysplasia. The coat is easy to groom. Simply remove the dead hairs with a firm bristle brush. Only bathe if necessary. The coat is naturally water-proof.